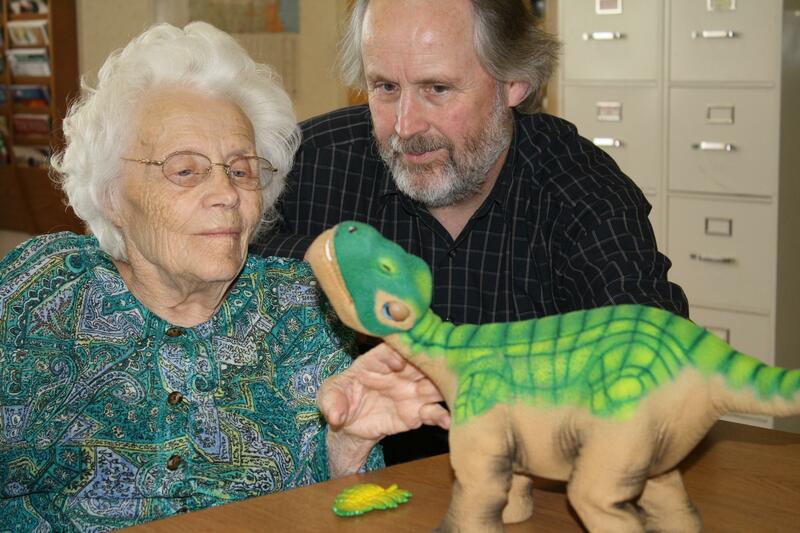 Pleo : Can a baby dinosaur really help heal people? We all need a friend some time, and after a life threatening accident that leaves your body broken, unable to move properly, a friend can be the best medicine possible. Especially a cute little green baby dinosaur so adorable that you can't help yourself from petting. Sacred Heart hospital has a new 3 and a half pound bouncing baby staff member named Pleo. 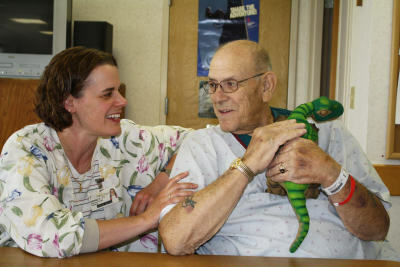 The hospital discovered that Pleo is a heck of a companion and surprisingly, also a form of fun that is therapeutic both to body and soul. We all know the power of a good pet to brighten our day and no greater testament to Pleo's ability to do that comes from Gary Sandvig who said "I would talk to it and hold onto it, much like I do with my own pet Diesel. He interacted with me. In a way, he kind of took the place of my dog." Gary, who suffered a spinal cord injury in a motorcycle crash, has difficulty in using his hands. It would be expected that a funny responsive little guy like Pleo would help lift his spirits, but what surprised Gary and the hospital staff is that playing with Pleo helped build strength in one of his hands while petting him. Most importantly, it was fun so it didn't feel like therapy. Most of us know someone that has mobility problems. Perhaps a favorite aunt or uncle, beloved parent or even grandparent, or someone who has suffered a terrible accident. Someone who can't have a real dog or cat because of health problems, or just isn't able enough to take care of one. Now they don't have to be without a constant companion and with Pleo, they can have a little friend to keep them company who can even help them get stronger just by playing with them. In the words of Ben Johnson, a Certified Therapeutic Recreational Specialist at Sacred Heart "A lot of people have upper extremity problems causing weakness in their arms. The stroking of a pet provides huge benefits to them, making their arms and hands stronger". Although this is a powerul point about pets in general, in this case, Ben means specifically Pleo. 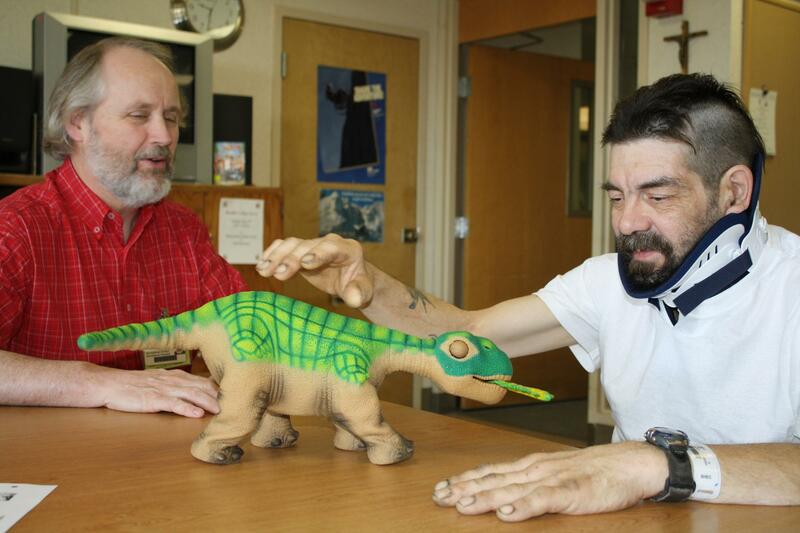 "The 3.5 pound robotic dino is easy to lift and has been particularly helpful in improving the strength and dexterity of patients without making the exercise feel like therapy". But no words can describe the elation at seeing real people in need getting real comfort from Pleo as the pictures on this page clearly show. Take a moment to enjoy them and definitely click on each of them to see them full size. 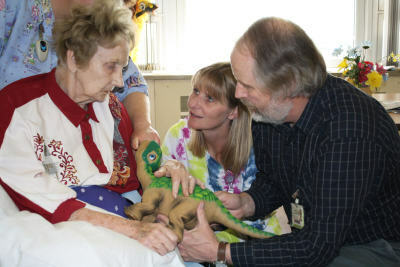 A big giant double thumbs up goes out to Sacred Heart hospital for having the vision to try innovative alternative therapies for their patients and for caring enough about them to give Pleo a try, and in the process, make believers out of all of us that Pleo is indeed good medicine. When you're done here, click on the link below to visit PleoWorld and learn more about this charming and amazing little robotic companion that can bring smiles and real health benefits to the people we love. Make sure you read the complete article from Sacred Heart and read in their own words their appreciation for Pleo and what he has done for their patients.